Richmond Park Condos: Stunning just built carriage home in the fastest growing area of North Naples. Designed with exquisite taste and clean lines this first-floor unit offers wide lake views, impact-resistant glass, over-sized lanai and an attached 1 car garage. 2 bedroom, 2 bath home boasts a master suite with water views, an oversized bathroom, and large walk-in closet. Enjoy morning coffee and nightly sunsets from the screened lanai in this pristine unit. Ready for quick move-in - easy to show! You'll be able to WALK to the upcoming proposed Town Center at the corner of Immokalee Rd. and 951 with theaters, dining, shops and more! Already across the street from Starbucks, restaurants, hospital, Publix and more! HOA fees include: cable / internet, irrigation, lawn and landscaping, exterior pest control, trash removal and water! As well as a beautifully decorated clubhouse, with indoor lounge and dining areas, full kitchen and heated pool. 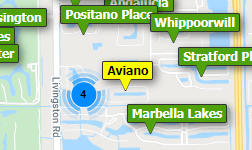 Need professional assistance selling your property at Richmond Park Naples? Find out how an Area Specialist can help to generate more property exposure in order to get the most money for your investment in the least amount of time.